Curses are a controversial subject among witches. Without doubt, the traditional image of the wicked witch has her cursing all and sundry - curdling the milk, blighting the crops and striking people down with horrible ailments just by muttering an ill-intentioned hex. It is a depiction modern day witches have worked hard to overcome. Wiccans, and most other neopagans, like to see ourselves primarily as healers and helpers. We cast spells for good, not to cause harm. Many believe that cursing is not only pretty anti-social, it is also dangerous because the bad luck can rebound on the caster. Yet there are also those who say that if you can't curse, you can't cure, and that if you are going to master even the whitest of white spells it is useful to have a little knowledge of the darker arts. A new book due out this month, By Spellbook and Candle by Melusine Draco, explores that area of magic. 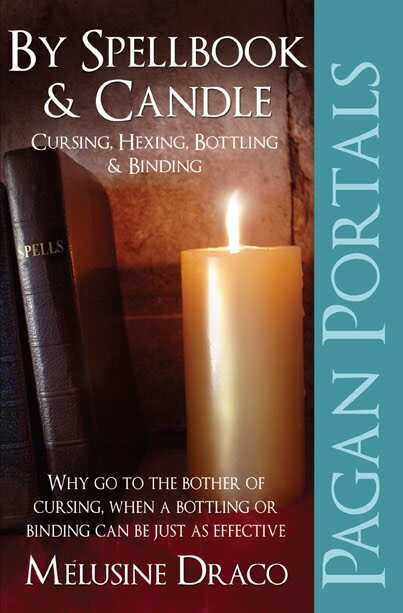 The book, by the author of Traditional Witchcraft for Urban Living and Traditional Witchcraft for the Seashore, is all about cursing. It looks at the history of cursing, and shows that curses have been widely used throughout history, in all cultures and by people of all faiths. The Ancient Egyptians protected tombs with curses, Romans were quite happy to curse those they felt had done them some wrong and people in Biblical times threw curses - even very God-fearing people. Publisher O-Books says about By Spellbook and Candle: "Curses have given the world some of its greatest legends and folklore, and the more grisly and gory, the better we like them. But cursing, or ill-wishing, is not a practice confined to magical practitioners - black, white or grey - it is a form of expression intended to do harm in reparation for some real or imagined insult and can be ‘thrown’ by anyone of any race, culture or creed without any prior experience of ritual magic or witchcraft." But By Spellbook and Candle is far more than just a history book or even a book about folklore and superstition; it is also a practical manual. If you like, it is a grimoire of curses from a wide range of sources. There are traditional curses from the British Isles, African curses, Egyptian curses, Voodoo curses, curses taken from literature, Wiccan curses, Biblical curses and even a few Satanic curses. You can take your pick. But, if a curse sounds a bit too much like black magic for your tastes, then Melusine Draco also explains about alternatives. As Publisher O-Books says: "Why go to the bother of cursing, when a bottling or binding can be just as effective." Bottlings, such as traditional witch-bottles, are ways of containing either positive or negative energy, usually to protect a building. Bindings can be used to prevent people doing something unwise or unwanted. Both of these are less severe than a curse, and less final. According to By Spellbook and Candle, a true curse can never be lifted or broken - it can only be deflected or sent back to the caster. A final chapter in the book shows just how to do that if you think you have been cursed. I'm sure this book will find critics who feel the subject matter is one best left alone - that curses are invariably evil and so it isn't sensible to publish a book on how to do them. Personally, I don't think such censorship is at all helpful. There is plenty of information on curses out there on the internet already for those who want to learn about them. Better to have a responsible book that explains the dangers of cursing and the ethical questions about them. I hope I never feel the need to cast a curse on anyone or anything. But if I ever do, I want to know the best way to go about it. And this book would be a good one to turn to for that information. Melusine Draco has been a magical and spiritual instructor for over 20 years, and is the author of numerous popular books on magic and witchcraft. Cool review Badwitch, I might pick it up.